Greece, a sunny and warm country, is officially a top European golf destination with the addition of the Costa Navarino development. Costa Navarino, a luxury resort and golf club set beside the Ionian Sea in historic Messinia, features two 18-hole championship golf courses. The original Dunes Course, designed by Bernhard Langer in association with European Golf Design, winds through native areas and centuries-old olive groves. The Bay Course, which opened in 2011 and was designed by Robert Trent Jones Jr., has even more bay-front property and blends resort-style playability with one-of-a-kind sea views to make for a pleasant experience. In addition to the two golf courses are two side-by-side Starwood brand five-star properties, the Westin Resort, Costa Navarino and The Romanos, a Luxury Collection Resort. The two hotels have open-air lobbies and many outdoor features in their guest rooms to take advantage of the region's sunny, warm climate that lends itself to golf all year long. The two hotels share a common area full of shops, multiple dining concepts, pools and much more, while excursions to historic sites and crescent-shaped Voidokilia Beach are minutes away. The Romanos is a luxury Starwood-brand property at Costa Navarino. The Westin Resort at Costa Navarino includes many outdoor features in its guest rooms to take advantage of the region's sunny, warm climate. Scenic and peaceful Voidokilia Beach is just minutes from the resort at Costa Navarino. Between the Westin and Romanos hotels at Costa Navarino is a common area with multiple indoor and outdoor shops and dining venues. 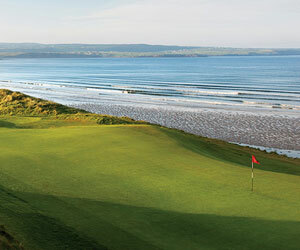 Bernhard Langer, in association with European Golf Design, sculpted the original Dunes Course at Costa Navarino in 2010. Robert Trent Jones Jr. designed the Bay Course, which opened in 2011 at Costa Navarino. Costa Navarino's Bay Course features several holes that play beside the bay leading out to the Mediterranean Sea. Costa Navarino - Bay G.C. Costa Navarino's Bay Course is set in rolling, lush hills beside the sea. The Dunes Course at Costa Navarino features a large clubhouse with a restaurant overlooking the layout.